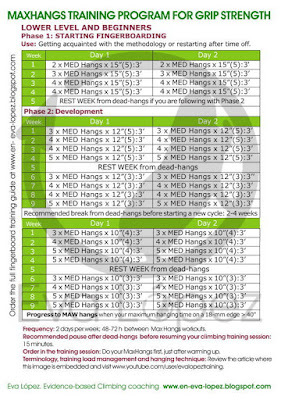 I. Dead-hangs training guide. Preliminary evaluation. The first blog entry in this series. If you need a refresher, here it is. The methods, naming conventions and load management were the topic of the second post. You can find it here. • how many days per week do I work my dead-hangs? • is it better at the start, the middle or the end of the session? • what method do I use, with[out] added weight, intermittent? • do I start with longer or shorter hang times? • if my objectives include strength and endurance, do I start with strength or do I train both simultaneously? Let’s tackle one bit at a time. For improving: 2 days/week, 48-72 h recovery between sessions. Maintenance: once you get to a reasonable level, 1 day/week can be enough to keep your gains. In case you train up to 5-6 days per week, or if you don’t climb on the weekends you can do 3 hangs sessions per week, but the 48-72 h rest between sessions is still compulsory. - When you are under high stress, or if your daily job is very physical. - If you notice that you can’t reach the same absolute load (hold depth/difficulty or weight) from one session to the next without apparent reason; also if your focus is on high-quality training, prioritizing either the dead-hangs or the rest of the session contents. - In case your recovery ability is compromised for any reason, or you notice that your performance regularly suffers in the second session of the week. 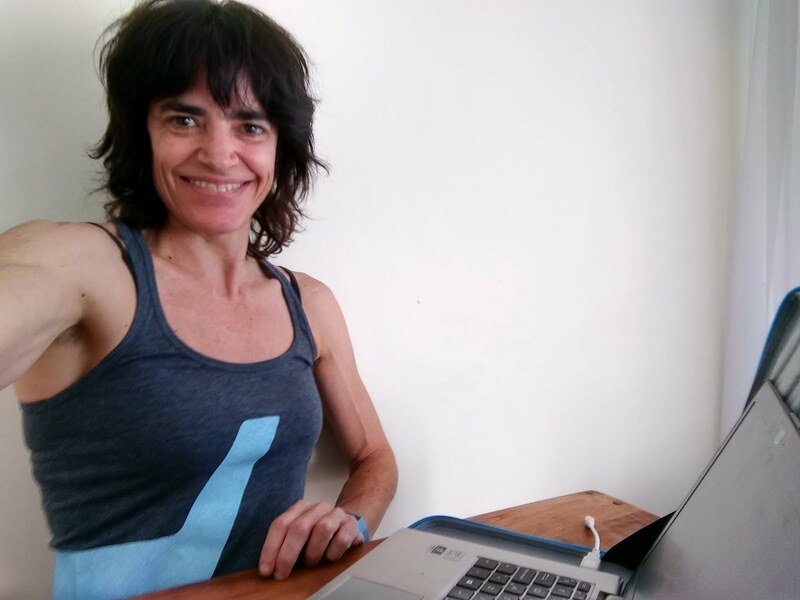 Anyway, you need to review the way you train/climb the rest of the days, if your diet and sleep habits are right (Chennaoui et al., 2015; Fullagar et al., 2015; Halson 2014). Everything counts, so you should control the factors that influence you fatigue, cognitive performance, motivation and, critically, those that can end in overuse syndromes or overtraining. 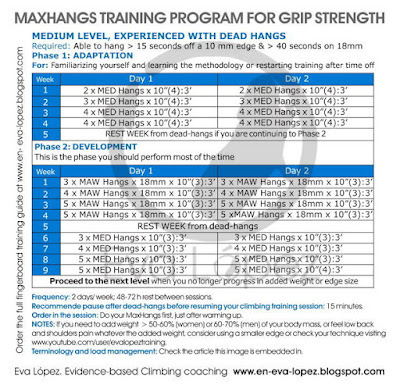 A maximal dead-hangs workout (MaxHangs, see the glossary here) should always be the first content of the session. Intermittent dead-hangs (IntHangs) and SubHangs also work better at the start of the session, unless the main content for the day is boulder, in which case the hangs will be after it, and before other climbing-based [power-]endurance methods if there are any. If you train 4 days per week: place MaxHangs on strength/boulder days. However, if you are a boulderer, I would recommend you to dedicate training days only to fingerboarding together with any other strength & conditioning content that didn't involve fingers and others days to climbing-based workouts. For IntHangs choose power-endurance/endurance days. This is valid for linear, nonlinear or undulating periodizations (see next section). If you train 2 days per week: follow the rule set in 3.2.1. 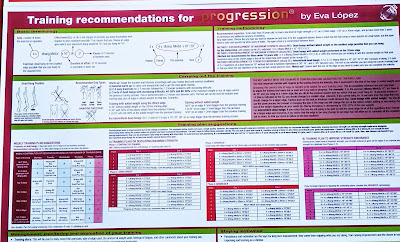 You are already familiar with the principle of progression, one of the three principles every training plan must honor (with specificity and personalization); the idea is to apply increasing, strong (but not excessive) stimuli, spaced enough for recovery, aiming to gain performance while avoiding injury or overtraining (more correctly, non-functional overreaching). 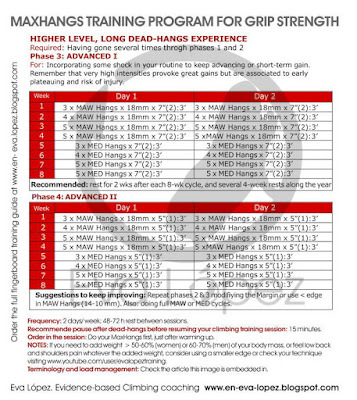 • Maximal grip strength, through neural aspects, or structural developments (hypertrophy, capillarization, etc.). For more on these adaptations look at this entry. • Grip strength-endurance, when the objective is to extend the time to fatigue on progressively more difficult holds, or recovering quickly between successive high-intensity grips. In short, we are looking at different schemes for MaxHangs, IntHangs or SubHangs. 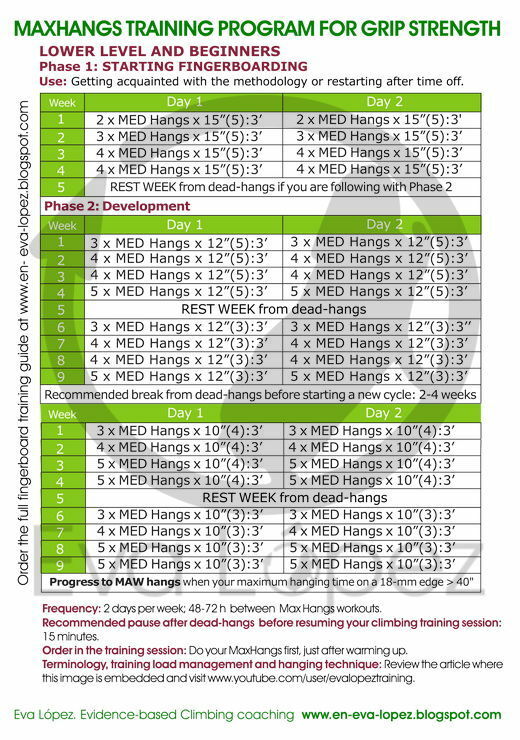 We can reach up to 8 sets of MaxHangs during a 6-week cycle if we rest for about 2 weeks after. In the case of IntHangs and SubHangs it’s possible to link up to 8 weeks (3-4-5-5-3-4-5-5) followed by a compulsory rest from dead-hangs 2-3 weeks long. a) Repeat the same initial plan because you consider it still has potential to yield positive results. In the IntHangs methods it is common, every 4-8 weeks, to alter the pause between repetitions, then the pause between sets and later the number of repetitions per set; in the long term we can change the hanging duration for each repetition. The decision must take into account if we want to promote intensity (using smaller/more challenging holds -in case you are training sloper strength or heavier weights), adjusting volume and pauses in order to sustain the high load along the workout, seeking hypertrophy and high-intensity endurance; or instead we might focus on volume, which leads to metabolic changes, oxidative capacity and substrate buildup associated to endurance. In SubHangs we have two options: we can a) keep the pause between repetitions and the intensity (edge or *hold size/difficulty or added weight) and extend the hanging duration for each set in 4-week cycles, or b) use a fixed hanging time and hold/weight while shortening week by week the rest between sets along said 4 weeks. Finally MaxHangs, where varying the intensity is the way to go; as the intensity goes up the hanging time or the margin to failure go down, also in 4-8 week periods. *Note: Most of the times in my entries I have talked about size edge or smaller edges when talking about half-crimp training, but in reality we can and we should use these methods to work on every grip type: open hand, sloper strength and pinch strength. For such training goals we should use more rounded edges, with softer edges, compared to half-crimp for open hand training; balls or slopers of different difficulty (slope and diameter) and pinch blocks of different width or depth for the pinch grip workouts (using dead-hangs for improving strength for this latter grip type wouldn't be recommendable except for certain climbers profile). Let’s have a closer look at each strategy. In maximal strength methods this is crucial when the aim is neural development; in MaxHangs this is achieved with smaller or more difficult holds or heavier added weight (which correspond to shorter hanging time) and/or reduced margin before fatigue or muscle failure. a) extend the time to fatigue for a fixed absolute intensity (edge depth or added weight). In other words, try to make this absolute intensity into a lighter relative load (a lower percentage of our maximal strength). b) maintain the relative intensity with moderately long hanging times; to achieve this we need to choose smaller edges/more difficult holds or add more weight as our endurance improves. This way the relative intensity is stable while the absolute intensity goes up. Time for zooming further in, starting with the margin. 3.3.2.1.1. When is it advisable to modify the margin before failure? • MED hangs x 15”(3) :3’; the holds used in the previous cycle allowed to hang for 20” (even though the hanging time was ‘just’ 15”), but we now must choose a smaller edge/more difficult hold because the potential hanging time is 18”: the absolute intensity is higher, right? Those among you familiar with 3-second margins, which places you in the intermediate level group, can experiment with 2 and 1-second margins in some cycle. But don’t lose sight of the fact that longer hanging times and mid or mid-high intensities (from 10 seconds onward) combined with margins shorter than 3” put you really close to muscle failure and are comparatively more exhausting. The same three-second margin is harder in a 12-second dead-hang than in a 6-second one. In the former case you’ll probably have to change to a deeper hold or remove some weight as the session progresses. When the margin is too short the expected neural effects can be compromised while metabolic and structural changes are favored, in the form of hypertrophy or enhanced substrate repletion, even if we respect the recovery periods between sessions and mix them correctly with the rest of contents. • Failure or near failure is desirable at the end of a IntHangs or SubHangs session when the pause between sets is less than 2 minutes. When the pause is longer, up to 3 minutes, we want to reach failure in the last repetition of each set (IntHangs) or at the end of each set (SubHangs). • In the case of MaxHangs, as we already mentioned, reaching failure is discouraged in principle. Nonetheless, if you haven’t had any previous bad experiences in this regard, you can experiment with maximal strength and failure; occasionally, for one repetition, session or even a cycle, you can test your limits or provoke some impact in your training. Sufficient recovery for that kind of effort must be enforced. If you are interested in fatigue control I recommend you read the recent article by Morán-Navarro et al. (2017). 3.3.2.1.2. When should I employ the hanging time for intensity management? You’ll be right to think that this strategy makes sense in the context of IntHangs, SubHangs or other strength-endurance methods (maximal strength needs complete or near complete pauses by definition). But we should not forget that even in endurance methods the rest periods must make it possible to sustain the average intensity that we want throughout the workout. • IntHangs: we can, as an example, start with a 4-week cycle where the pause between repetitions is 30”. The next 4 weeks we cut it to 20”, and later we would do another cycle with 10-second pauses between repetitions. The future progression we could start making the recovery between sets shorter, going from 2 minutes to 90” to 1’. • In SubHangs we started extending hang times; now, perhaps a season or a year later, the edge depth/hold difficulty or weight will still be fixed and our goal will switch to briefer recovery times. Example: in the initial 4-week cycles the pause was 2’ and the hanging times 20”, 30” and 45”. Now we are in a new phase and the hang durations can go from 20” to 30” but, additionally, the time between sets will be 90”, 1’ and, in the last 4-week cycle, 30”. a) When we realize that, whatever the cause, we don’t feel recovered in 3 minutes. b) When both the absolute and relative loads are high, especially if the hang time is 8 seconds or less. c) When we feel extra strong and during high-intensity/competition microcycles. If the categories above don’t apply, the standard pause between sets is 3’; in case you are learning a new exercise, device or method and, thus, are using loads much lighter than the ‘real’ training ones, a 2 minutes rest would be acceptable, you have a choice there. When deciding which method to choose for each case you first need to be familiar with the effects of the tools available. 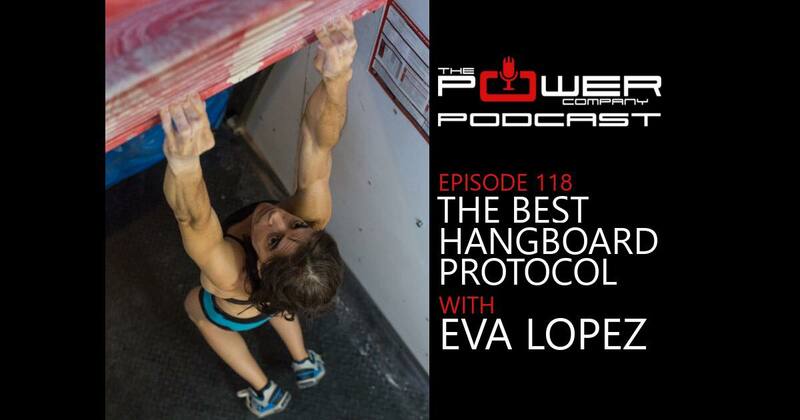 there is information about a study that compared the effects on grip strength of different hangboard programs, and in this one, the influence on grip endurance. 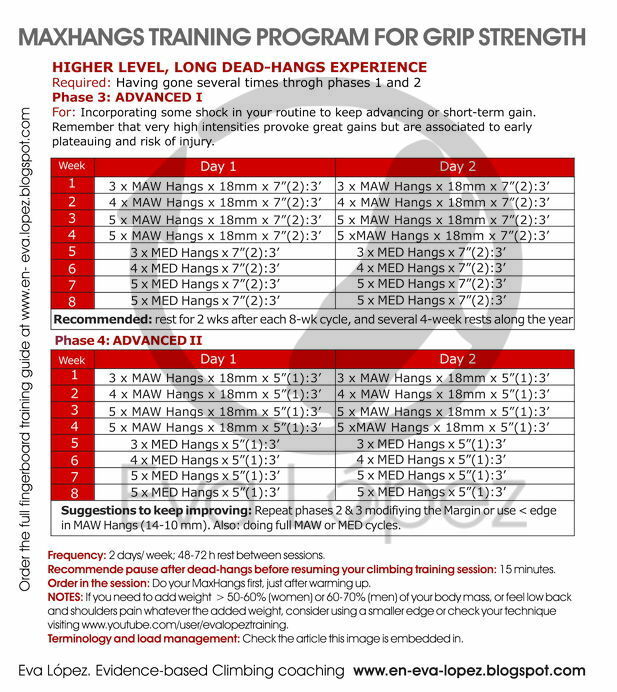 To learn more about intermittent dead-hangs you can visit this blog post and this last one shows why it is better to start with a method were no added weight is used (MED hangs) if you are new to hangboarding, and when you could start with added weight (MAW hangs). In general, if we seek long-term gains, the way to obtain greater and more sustainable improvements is to periodically change the stimulus by tuning one variable or other. This is what periodization means. We are going to achieve this via a wide range of intensities and hang durations and/or alternating or sequencing methods. In the short- and mid-term, most of our periodization proposals can be considered as linear. We are using this scheme when every four to eight weeks of MaxHangs we shorten one or two seconds the duration of each set, increasing both the absolute and the relative intensity. The same goes for IntHangs when we tune the recovery times while keeping the same total effort duration (sets x reps x repetition duration). Reverse periodization is another example of the linear pattern, like we do in SubHangs: the absolute intensity (edge size or hold difficulty/weight) is fixed and the hang time goes up every 4-8 weeks. This kind of periodization is more suited for those who plan to achieve an optimal performance at an specific date or period and is also the most used in sport periodization. When we zoom out and start looking at the long-term I propose we use a nonlinear pattern, though. There are a variety of schemes and terms, but we can point to two of the best known ones: Undulating (daily or weekly) and Block periodization. In a nutshell, they consist of frequent oscillations in intensity, with a periodicity that can go from monthly to daily. My suggestion is choosing a linear pattern the first year we start a method and then switching to a nonlinear one. Let’s see how this works. 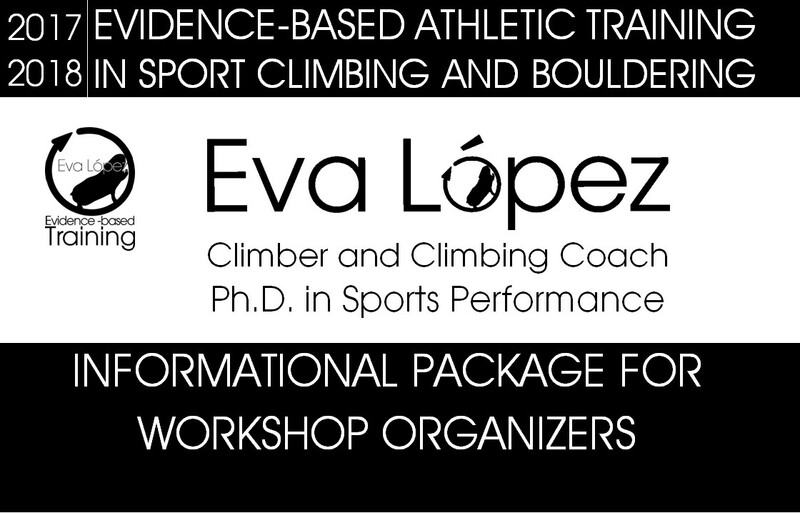 • Athletes with extended experience with linear periodization that do not progress anymore. • Stretches of time when the goal is to maintain the previously acquired level, or when the goal is not reaching peak performance at a specific point in time but to perform at an average level for some time (this is habitual in team sports). • It also makes sense when we value a more relaxed approach to training that prioritizes richness and variety of inputs. Mondays: MaxHangs; Wednesdays: IntHangs; Fridays: SubHangs. Week 1: MaxHangs; Week 2: IntHangs; Week 3: SubHangs. For intermediate level climbers: Weeks 1-2: SubHangs x 20”; Weeks 3-4 : MED MaxHangs x 15” (4); Weeks 5-6: MAW MaxHangs on a 18 mm edge x 10” (4) . Turning the intensity up and down in 2-week cycles: from 20” to 10”, then 5”, 8” and so on. - Block 1: 4-8 weeks of MaxHangs for maximum strength. Block 2: 8 weeks of IntHangs or SubHangs to work endurance. Block 3: rest from dead-hangs if it is a competition cycle, or 2-3 weeks of MaxHangs with shorter hang times to recover some maximum strength. Generally speaking, MaxHangs allow us to gain strength via neural changes, while IntHangs improve our endurance and also have certain effect on strength (possibly via hypertrophy). MaxHangs have shown some influence on endurance as well. However, these effects depend on personal characteristics, and we will explain this now. I’ll soon be presenting at the 4th IRCRA Congress a study conducted by myself where participants with a lower level of strength would gain endurance on an 11 mm edge after performing 4-weeks of MaxHangs, while stronger ones (> 30kg for 5 seconds on MAW test on 15 mm) tended to gain little or even lose endurance after the same intervention, probably due to the fact that more trained athletes need a longer training program or higher stimulus, or more varied to experiment strength gains (Deschenes & Kraemer, 2002; Häkkinen et al., 1985; Mangine et al., 2015; 2018). In any case, with an endurance goal in mind you may opt for IntHangs directly if you fit in the latter group or propose a longer program (> 8 weeks). While if you think to belong to the former there’s a potential advantage to first gaining some strength through MaxHangs -even if your goal is endurance- and then proceed to IntHangs. The immediate result is that you will work your IntHangs on smaller edges or more challenging holds, and what climber doesn’t want to grip a succession of tiny or terrible holds? 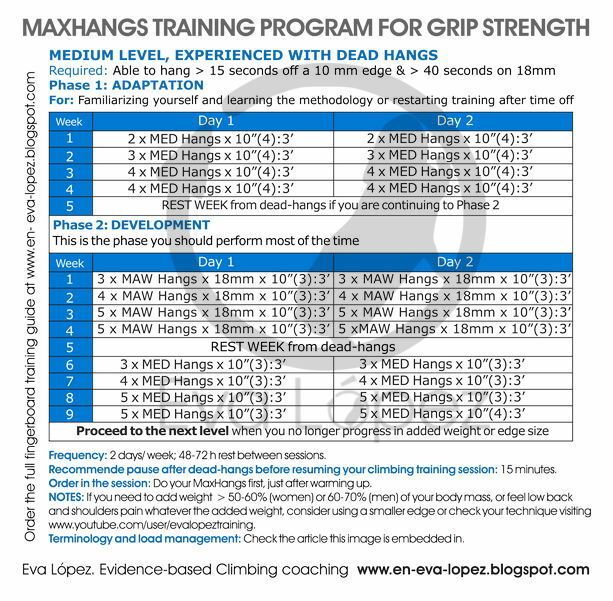 - Those new to MaxHangs can expect benefits in just 4 weeks, but strength will keep going up for 8 weeks, or even further if the hanging time is reduced (from 15 to 12 and 10 seconds, and even 7 and 5 seconds). - The minimum recommended length of a IntHangs cycle is 8 weeks as was explained in this previous blog. No matter what method we are dealing with, its marginal effect decreases with time, up to the point where we plateau. This is specially true of MaxHangs with times shorter than 10 seconds. Be prepared to detect this trend and implement changes before it happens (by now you won’t be surprised if I tell you that switching every 8 weeks is a good rule of thumb). At certain point, though, we have to realize that maintaining certain level can be considered a success; the body does not have an unlimited ability to adapt. In the context of strength there are facets that go beyond maximum force: explosive strength is important and at times we’ll have to make room for specific exercises like jumping to edges, explosive dead-hangs and campus board. - Choosing one cycle and repeating it while it still yields some benefit, the default when you are new to a method or start from a low level for some reason. - Picking one method and sticking with it for one cycle, for example 8 weeks of MED or MAW (instead of 4 wk MAWt + 4 wk MED). - Shaping the programs to suit your preferences and experience, playing with one variable like hang time, number of sets, etc. - Applying different linear and nonlinear periodization patterns. And remember that in the long run there is no “magic bullet”meaning magic load or method, and the stimuli need to be varied periodically and keep in mind the “minimal effective dose” rule. Review all the info if necessary. • Signs of excessive load while working out: raising the shoulders, elbows, torso or legs, and too much tension anywhere in the body. • Signs of excessive fatigue that should convince you of aborting, and delaying the session one or two days: difference >2 mm in edge depth or >25 % in added weight from the previous session. Smaller, occasional differences can in principle be due to normal fatigue and require just adjusting the load. • Signs of inadequate load progression: needing an easier edge or added weight for >2 sessions in a row; pain in fingers, wrists, elbows or neck; reduced performance in general. Revise your planning and do lighter workouts while you figure it out. • Start with the plan for beginners after your holidays, when you finished re-conditioning after an injury and, of course, if you are a beginner. Rest for 1-2 weeks after every 4-week MaxHangs cycle or 8 weeks of IntHangs. • In advanced phases and long cycles rest for 2 weeks after 8 weeks of MaxHangs or 16 of IntHangs, and observe two or more one-month no-hangs periods every year. • Keep a training log: exercises, edge sizes/hold difficulty and weights, perceived fatigue and progression, incidents, etc. ; it helps monitoring your process, self-knowledge an motivation. • Signs of an effective planning: being able to hold smaller edges/more difficult holds or heavier weights as the cycle goes on. If your evolution feels a bit slow remember that the higher your starting level is the slower and smaller the gains will be, and vice versa. And this ends today’s post. Thank you very much for your motivation, I hope you com back for more as I follow with this series, which will feature IntHangs and SubHangs programs as well as nonlinear periodization examples where MaxHangs, IntHangs and SubHangs will be combined. 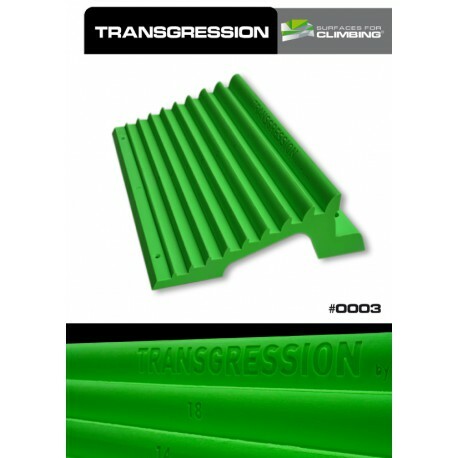 The training guidelines that are provided with the Progression and Transgression hangboards in format poster (330 x 483 mm) contain a condensed version of the info in this series, plus IntHangs programs yet to be published. These guides are now also available separately from the boards. You can order them now at evalopezblog@gmail.com. Its price is 18€. • Maximal hangs, Intermittent Hangs (Repeaters) or a Combination. Which 8-week program is more effective for developing grip strength in rock climbers? • Why do intermittent dead hangs? • Comparison on the effects on finger endurance of Max Hangs vs. Int Hangs vs. a combination. (ahead of print in Journal of Human Kinetics). Deschenes, M. R., & Kraemer, W. J. (2002). Performance and Physiologic. American Journal of Physical Medicine and Rehabilitation, 81(Suppl), S3–S16. Chennaoui, M., Arnal, P. J., Sauvet, F., &amp; Léger, D. (2015). Sleep and exercise: A reciprocal issue? Sleep Medicine Reviews, 20(June), 59–72. Fullagar, H. H. K., Skorski, S., Duffield, R., Hammes, D., Coutts, A. J., &amp; Meyer, T. (2015). Sleep and Athletic Performance: The Effects of Sleep Loss on Exercise Performance, and Physiological and Cognitive Responses to Exercise. Sports Medicine, 45(2), 161–186. Mangine, G. T., Hoffman, J. R., Gonzalez, A. M., Townsend, J. R., Wells, A. J., Jajtner, A. R., … Stout, J. R. (2015). The effect of training volume and intensity on improvements in muscular strength and size in resistance-trained men. Physiological Reports, 3(8), e12472. Mangine, G. T., Gonzalez, A. M., Townsend, J. R., Adam, J., Beyer, K. S., Miramonti, A. A., & Ratamess, N. A. (2018). Influence of Baseline Muscle Strength and Size Measures on Training Adaptations in Resistance-trained Men. International Journal of Exercise Science, 11(4), 198–213. 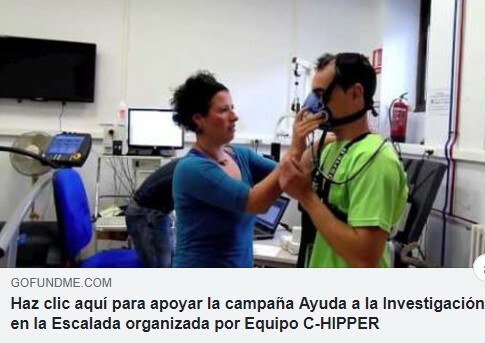 Morán‑Navarro, R., Pérez, C. E., Mora‑Rodríguez, R., de La Cruz‑Sánchez, E., González‑badillo, J. J., Sánchez‑Medina, L., Pallarés, G. (2017). Time course of recovery following resistance training leading or not to failure. Eur J Appl Physiol, 117(12), 2387–2399.